As basic as can be. Elegant and minimal with a maximum of usability. Interchangeable legs enhances the versatility. It’s your coffee table, lounge table set, pedestal side table, above the seat table… You can slide the table above your seat for your laptop, iPad, book or glass of wine. Because you can easily change the legs, without tools, you can adapt it to your use. Finished in a beautiful matt grey-black special coating, called Carbon. Or in a very matt white called Kaolin, colour comparable with RAL 9010. The tabletops can also be finished in natural American Walnut. 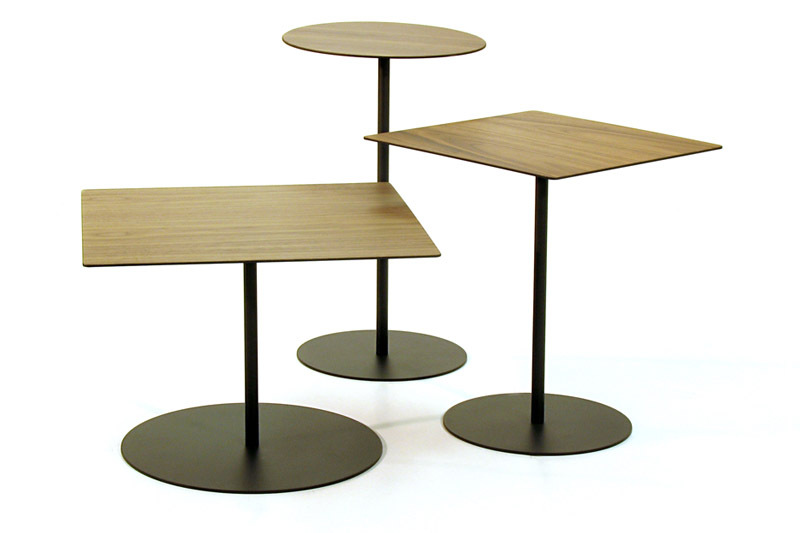 The tabletops are only 4 mm thick, the bases only 6 mm and the legs only 22 mm thick. The designer couldn’t help thinking about the growing nose of Pinocchio looking at the legs and their different lengths. Colours: grey-black (Carbon) or matt white (Koalin). Tabletop: in colour, or finished with natural American walnut.